While I'd love to say that every evening, after a long day at work, is spent in my kitchen working a recipe from scratch, I'd be a liar if I did. I love cooking - I love taking complicated recipes and accomplishing them, or taking the simple ones and creating something deliciously sublime. But I'm a wuss. At 9am on a weekday, I've convinced myself I'll tackle a from-scratch meal, but by the time I'm slogging my way home through the traffic (and OMG, RAIN. Will it ever STOP? ), I'm crying uncle and looking for shortcuts. Enter, Trader Joe's. Of all the things that Trader Joe's does best (low prices, supporting local growers, above-average delicious frozen dinners, bricks of chocolate), I'd have to choose their line of "simmer sauces" as my favorite. They have a bunch of them - jars of sauces intended to marinade, simmer meat/tofu or both. They have a strong line of Indian ones (the Masala is our favorite), and a few Thai, Mexican and Cuban ones that offer you the depth of 'cooked for days in many spices' flavor without the time or added expense. I keep several jars in my pantry for just such nights when I don't want to be slaving over the cutting board or the stove, but I do want something healthy and full of flavor. I typically make them with chicken - either full boneless/skinless breasts, or cut into strips or cubes. Recently we tried the Cuban Mojito sauce (double-duties as marinade or simmer sauce), a light, sweet-citrus blend with just a hint of spice. I'll admit that being a mojito-lover, the sauce doesn't really mimic the drink in any way (no mint! ), but stands on it's own merit just the same. For a hearty (and healthy) themed-meal, in 30 minutes or less, I pan-fry chicken breasts in a little bit of olive oil in a skillet, until browned, about 5-6 minutes both sides. Dump in half a jar of the Cuban Mojito Sauce (for 3 large breasts, or 4 medium ones), cover, leaving lid slightly ajar and simmer, turning breasts once more to coat half-way through. 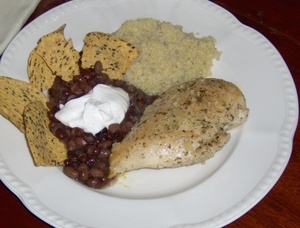 I like to serve the chicken with a rice and beans "idea", although straight rice and beans, traditional-style, would be a perfect side dish. In an effort to aim for healthy eating, and because we actually like it this way, I substiute quinoa for the rice. Rinse one cup of quinoa, add to a medium saucepan with 2 cups of water, a pinch of salt, pinch of pepper and tablespoon of lime juice. Bring to a boil, cover and bring to a simmer, leaving lid on for 12-15 minutes until water is evaporated. Fluff quinoa and serve. As for the beans, we use the Cuban-style Black Beans from TJ's as well, which are enhanced with a smoky flavor. For added heat, hit the beans with a pinch of chili powder. Top the beans with a dollop of sour cream, and a few tortilla chips (you guessed it - soy and flaxseed tortilla chips from TJ's! ), and you've got a great-tasting dinner done in under 30 minutes. I've never had the desire to make my own pizza. I don't eat it often, so when I want it, I want it loaded up. It seemed ridiculous to buy whole quantities of items just to top one pizza, and then oh! the time it would take, blah, blah, where's the delivery phone number? If I ever did have a slight desire to make my own, it died with the invention of Boboli. Ugh. I had the misfortune of agreeing to attend a school-friends "pizza" night only to find my plate adorned with this bizarre concoction. Let's face it - the crust is 98% of what makes a pizza good. For all the arguments about what makes a pizza the best (NY! Chicago-style! Californian! 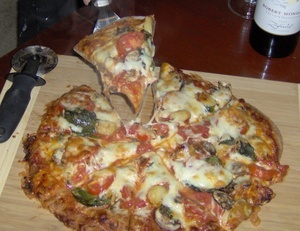 ), most of those arguments revolve around the crust. Thin, thick, deep-dish, crispy, foldable, inserted with cheese, etc. There's a good reason why a commonly-heard question at anyone's pizza dinner is, "Can I have your crust?". Boboli robs us of our pizza foundation. Even with the insertion of Boboli into our lives, it still remains that, well, even when pizza is bad, it's good. It's pizza, for crying out loud! Rich remembers when he lived in the dorms at Binghampton, the only pizza place that delivered turned out the nastiest pizza he'd ever had. They were the only game in town, so why bother to do it right? And yet, he and his friends ordered that pizza three times a week (I'm sure he edited that story; I know my husband, and I'm banking on 5 days a week, the other 2 days supplemented with leftover pizza from the nights before). When I lived in dorms, the only place that delivered and fit within a students budget was Domino's. Didn't stop us. Those were my dairy days (ranch dressing and extra cheese were my staple condiments...and my favorite pizza accompaniments come to think of it) and sometimes I still crave a Domino's pizza loaded with extra cheese. How bad can it be? It's pizza! So I was wandering the aisle at Trader Joe's and came across their pre-made raw pizza dough. I passed it several times over the course of several visits, and finally caved. The desire to throw together my own pizza was too strong. But never having done it - or wanted to - before, I didn't want to bother with making my own dough yet (should have - an excuse to finally use my dough hook on the KitchenAid!). Sort of like signing up for a free week at the gym before you commit to the full membership you will eventually stop using but inevitably keep paying because they're taking it right out of your checking account and you never think about it until you get your monthly statement, and you put it on a list of things to do but, LIFE. Anyway, I digress. Of course, it was ridiculously simple. It actually took less time and effort than I'd anticipated, thus squashing my plan to finish off at least half the bottle of wine with Rich while we danced around the kitchen making our pizza. Three sips and one topping away from the oven, we chugged and did a jig in an effort to make up time. I'd kept my toppings on my whole wheat crust to a respectable minimum - sliced crimini's, roasted garlic cloves, sliced roma tomatoes, fresh basil leaves and sliced black olives. But I forgot the olives (damn chugging!). 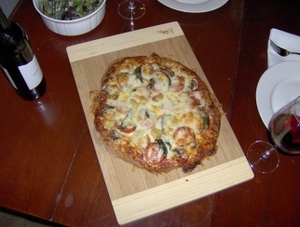 All topped with a quattro fromaggio shredded blend (thanks, TJ's!). 13 minutes later, and our (slightly misshapen) masterpiece was complete. Voila! But, was it good? Well, hell, it's pizza isn't it? In all seriousness, it was delicious. The wine was a respectable Mondavi Private Selection Pinot Noir, the accompanying salad an herbed spring mix with a creamy cilantro dressing. We had a few pieces left over the next day which brings us to Phase 2 of pizza loving - next-day cold leftovers for breakfast. Heaven. If we get a hankering again for homemade pizza (faster and cheaper than delivery), we'll invest in a pizza stone first (our crust preference is thin and crispy. It's the only pizza crust preference we agree on - he from NY with that NY pizza attitude, and me with my California-ized pizza crust taste buds that demand less grease and easier manageability in my slices - I need as little interference as possible in getting pizza from plate to mouth). I'll even attempt my own pizza dough -perhaps something with cheese in the crust. Or, perhaps not. So, it turns out my husband isn't exaggerating on our About page when he describes himself as a "goat" in the kitchen. When he married me, he married great and varied cooking (thanks, mom! ), but honestly, his descriptions of his childhood dishes frighten me with their obvious lack of anything resembling ... spice. But he recalls them fondly, and for that I proclaim him to truly have the broadest palette I've ever seen (makes him a not-so-trustworthy critic, though, as evidenced by the Great Cucumber Cake DIsaster). So his 31st birthday rolls around and I ask my husband, who has recently witnessed me putting together some truly scrumptious holiday dinners of late, "I'll make you anything you want for your birthday dinner - what would you like?". He mulls this over. First he starts with dessert (such a guy!) and requests banana cream pie from Banderas. Now, I love baking more than cooking. But are my feelings hurt? I cannot say they are. I was an adamant anti-banana cream pie activist until forced to taste Bandera's take on it. There are no words. I was instantly converted - but only for Bandera's mastery of it - all others fail to even compare. Onto dinner. And he finally lands on something. My delicious garlic and rosemary crusted roast? No. Brined to perfection deep fried turkey? No. So what does this excruciatingly picky birthday boy request? Salmon croquettes and spaghetti. Or, as my mom laughingly put it when I relayed the dinner plan, "pasghetti". The salmon croquette request lingers from his childhood as he fondly recalls the one dish his father made. The original recipe goes something like: canned salmon, egg, salt, roll in bread crumbs and pan fry. The spaghetti? Well, he just likes it, that's all. I've had the original recipe version and I have to say: bland (hey - my food criticism knows no familial boundaries!). To be fair I will include that Rich swears the pan his dad fried the croquettes in must have been well-seasoned because they were flavorful. Ooooo-kaaay. Fortunately for me, he agreed that I could find a good recipe and give him a suped-up version of his beloved childhood dish. After all, he is 31 and I had to eat it too! After much searching online (epicurious, all recipes) and not coming up with anything similar enough to what he loved but more amped up, I started thinking about the basics of salmon. What flavors do I love with my salmon? Dill and lemon. Period. Call me a traditionalist but none can deny the amazing ability of lemon to enhance the salmon flavor without overpowering it. I started mulling over some recipe ideas on how and what to do to create this masterpiece, and as a last-ditch effort before my trip to the grocery store, I checked the Bible, er, I mean Cooks Illustrated The Best New Recipe. Lo! A faaaaaabulous recipe for salmon cakes! Hell, even Epicurious boasted only one, and that one (though yummy sounding and definitely ear-marked for a later date) was too off-center from what Rich was really expecting. But leave it to good old Cooks Illustrated for not only testing the best approach but also for living in harmony with my own salmon philosophy: lemon does it best. My favorite part of the recipe was their denouncement of the standard canned salmon in favor of creating tender, moist and flavorful cakes with, duh!, FRESH salmon. Brilliant! The basic flavor compounds come straight from the fresh salmon, lemon juice, parsley and a smidge enough of mayo to act as a binding agent and give just enough tang. HERE'S THE PART WHERE I BLAME THE WINE: So we get started on assembly and our first order of business is to open the wine (Geyser Peak Sauvignon Blanc - excellent with seafood and affordable; $7 at Trader Joes and $12 at Safeway on sale) - natch! The thing I loved about reading the recipe is that the binding agents it called for were 2 tblsp of mayo and only one slice of white bread, crumbed. In no way too bread-heavy as so many seafood cakes are. I wish I'd remembered that (damn wine!) when I was actually preparing them. Can I blame this on the husband too? He's very distracting, what with the questions and the puns and the kick-line performances for the dog. (You heard me right). So I put all of the ingredients into the bowl and found it rather ... soupy. Odd, considering the next step was for me to form patties. Impossible! So I added another piece of crumbed white bread to help the situation. It did improve it, but not enough to form much of anything. Finally, I added yet a THIRD piece, prayed and "formed" to the best of the ability. Off the 8 raw hope-they-stay-together patties went into the freezer to take care of some of that moisture when I realize that oh crap the 2 eggs I put in the patty mixture were intended for the breading process only. If I'd had another 1lb 1/4 of salmon fillets laying around, I'd have scrapped the whole thing and started over. No fear! says the husband, eager to have his salmon cakes at any cost. But they'll taste eggy! says me, ready to throw in the towel and retreat to the living room with a full glass of wine, a plate of pasghetti and the Mean Girls dvd. Needless to say, it being his birthday dinner wish and all, I persevered, bitching the whole way, as I'm wont to do, and hey! if those suckers weren't the tastiest thing I'd had in a long time! Imagine how easy/delicious they'll be when I make them the right way! But really, so delicious that I proclaimed every night to be Salmon Cake night. Ok, maybe I was a little drunk by that point, but considering their ease and deliciousness, they are definitely going in the monthly roster. The salmon is moist and flavorful, the exterior crunchy and golden. The mayo is a must, giving a wonderful tang to the dish that would be missed. I spritzed some fresh lemon juice over the cakes, and while they were delicious beforehand, doing so really woke them up. Bright flavor without the breaded catastrophe I was expecting (and usually receive at restaurants). A+! DIRECTIONS: Run finger over fillet flesh and remove any pin-bones found. Remove skin and discard. Chop salmon flesh into 1/3-1/4 in sized cubes. In a mixing bowl, combine chopped salmon, mayonnaise, parseley, lemon juice and bread crumbs. Scoop mixture with a 1/4 cup and form into a patty; place patty on a baking sheet lined with parchment paper. Repeat until you have 8 patties. Place baking sheet in freezer for 15 minutes (reduces moisture on the surface). Prepare the coating: Put the cup of flour into a baking dish. In a separate shallow dish or bowl, combine the two eggs, tablespoon of vegetable oil and tablespoon of water. Put the panko or bread crumbs into a third dish. Using a slotted spatula, transfer a patty at a time to the flour to be coated. Shake off the excess and dip into the egg mixture, turn to coat, and then place into the bread crumbs to coat. Place the coated patty back onto the baking sheet. Repeat until all of the patties are coated. In a large heavy-bottomed skillet, heat the 1/4 cup of vegetable oil until shimmering, but not smoking. Carefully add the patties to the oil, and cook until golden, turning once, about 2 minutes per side. Place finished patties onto a plate lined with paper towels to drain. Serve with a spritz of fresh lemon juice.